With all that is going on in this world, stress has become an epidemic in our culture. Experiencing constant stress has been proven to cause physical and emotional illness as well as a more negative worldview. This workshop will explain what stress is, where it comes from, how it affects you, and those around you. We will explore ways to become aware of the stress you hold, and how to release it. Through lecture and relaxation techniques centered on meditation and movement, you can begin to release your stress and shift your focus inward to a more peaceful and joyous place. Leave with tools to continue your practice at home. PS.. 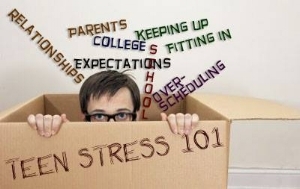 I am encouraging students who may feel a bit overwhelmed by school and life, to join this safe and trusting place to learn ways to find your way out of the box!